The Koolmat heat barrier is .070 thick and is made of silicone coated fiberglass. One side (fiberglass) is white the other side (silicone) is gray. 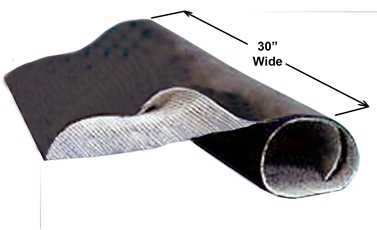 Heat barrier is easy to install, simply cut to desired shape and rivet, or glue into place. This barrier is designed to reduce heat in the drivers compartment which reduces driver fatigue.NOTE: Sold per running foot only. 1 foot = 2.5 square feet.